Yep, you sure know how to speak Spanish all right, but the majority of your readers probably do not—and inserting cool phrases into your sentences will only confuse them. Don’t assume they do! Of course, there are times where you do need to include Spanish names or phrases in your posts, so I think some guidelines are in order for such times. Yes, we all know you mean “Spain” when you talk about how much España has enchanted you, but if you’re writing in English, use the English name for the country. Please. Thank you. This means, talk about visiting Zaragoza (instead of “Saragossa”) or Sevilla (not “Seville”). But writing about the super-cheap flight you got to “las Islas Canarias” makes you sound like a snob. Nobody would know what you mean by that unless you said “the Canary Islands.” Also, you should refer to “the Basque Country” and not “el País Vasco.” Even worse would be to talk about “my life in Euskadi.” No. You do not speak Basque. You should use the English name for any of Spain’s many languages. Basically this all comes down to helping your readers understand your posts. 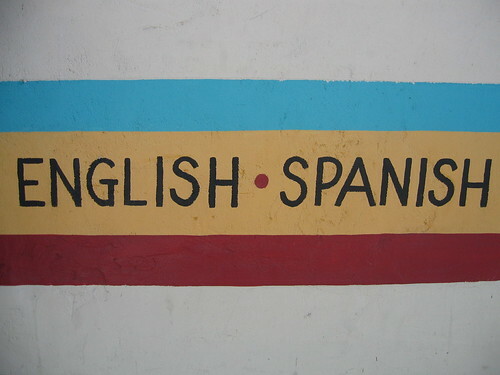 They most likely only read English, so sprinkling little Spanish words to sound cute or just because you’re so bilingual only makes your writing harder to read. What are some of your pet peeves about writing and foreign words? Do you think it’s okay to include little Spanish phrases here and there? Talk about it in the comments below! 1) Mark R. Williams, The Story of Spain (San Mateo, Calif.: Golden Era Books, 2009), 9.